8th Mtd Rifles. Cadets - 3 yrs. Height 5 ft 6 in. Weight 145 lb. Chest 32-36 in. Complexion fair. Eyes blue. Hair light brown. Sight 6/6. Hearing, colour vision good. Limbs, chest well formed. Full joint movement. Heart & lungs normal. Teeth - fair. Free from hernia, variocele, varicose veins, haemorrhoids, inveterate or contagious skin disease. Good bodily & mental health. Vaccinated 1896 & 1915. 2 small moles 2 inches apart lower Border ribs left side. Eldest son of George & Euphemia King (Effie, nee ANDERSON) HUXFORD, of Milford, Temuka, & later of Tokarahi Estate, near Kurow, North Otago; later of Ohaka, North Canterbury. Educated at Duntroon. Keen & able athlete - boxing, running, football. 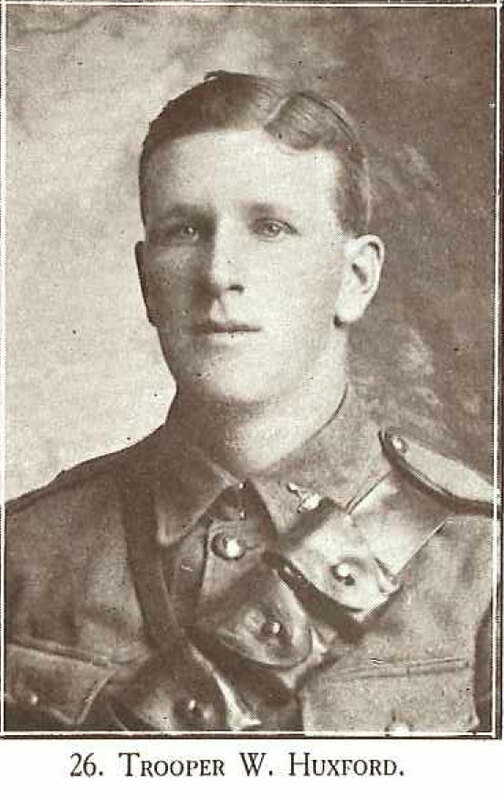 Brother George Warren HUXFORD also served in WWI. William departed with the Mounted Men by the slow train from Timaru on 17 August 1914, amidst much excitement in the town, whilst their horses were trucked at the Smithfield siding, Waimataitai. The Mayor spoke of the pride in them and said that they were going forward with stout hearts and strong arms. "Be true lads to your King and Empire, to yourselves and your country, and put your trust in God," he said. Cenotaph Database [19 November 2013]; NZ Defence Force Personnel Records (Archives NZ ref. AABK 18805 W5541 0058603) [20 November 2013]; CWGC [19 November 2013]; Timaru Herald, 18 August 1914, 19 June 1915; Dominion, 25 June 1915 (Papers Past) [19 November, 20 November 2013; 06 May 2014]; ancestry.com.au (photo) [21 November 2013].